Hours…. That was the duration of our trip to LA. The rain may have been part of the reason for the extended stay in the moving car. I really prepared for the trip: gassed up the car the night before; put air in the tires; I had my coffee in hand when we pulled out of the driveway… But before we had gone 20 miles, a yellow light on the dashboard commanded my attention. T P M S, it said. We pulled over and looked for the car manual. Couldn’t find it… In desperation we asked our phone. Amazingly, it had the answer: nothing to worry about. Good news! Back on the road the weather ranged from drizzling and pouring rain to bright sun. Though it was fun looking for rainbows in between weather systems, it was tiring. We stopped for coffee at about 4 hours out. In another two hours we had to stop again for the necessary rooms. It was at that point that we realized that Joy’s pocketbook had not made the trip with us from the first coffeehouse! A job for our phone again: First to find the correct shop among all the franchises on the west coast. We did remember the name of the town, so…. to make a long story short, we called and they had it! Next, a call to our daughter who solved the whole thing with a call to a national shipping company. We were about 25 miles from our destination, when we hit LA traffic. That’s where the last 2.5 hours of the trip were spent, and on the solstice, no less, when light is the smallest percentage of the day. We arrived in pretty good shape but, when I looked for my pencils to do today’s sketch, I realized that they were in Joy’s pocketbook. Below is my visual diary of the day, done with borrowed mechanical pencil. 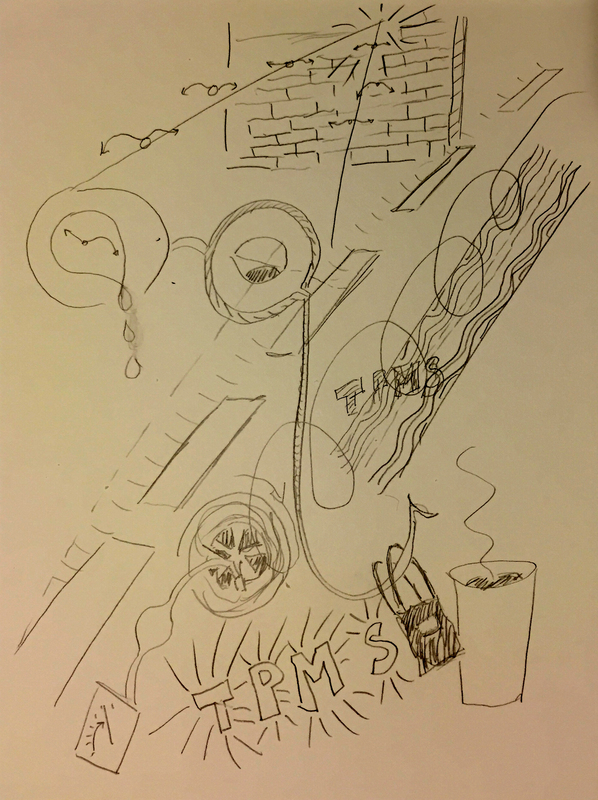 This entry was posted in Personal Stories and tagged artistic process, creativity, drawing, mechanical pencil, pencil drawing, road trip, sketching, visual arts, visual diary. Bookmark the permalink.